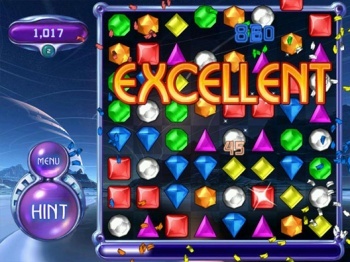 Want to download Bejeweled 2 for free without getting in trouble? Act quickly, and you can. Let's keep this short and sweet. PopCap is allowing anyone and everyone to download Bejeweled 2 for free, but only until the end of today. That means you'd better get over to PopCap's website and download it, assuming you aren't one of the millions that bought it already. Are you still reading? Okay, what can we say about Bejeweled 2. It's the sequel to PopCap's very first game that launched the company to success after its founding in 2000. You match jewels until it makes you sick. It has multiple modes to throw some variation into the mix. It's fun. Bejeweled 2 is free today to celebrate the 10th anniversary of Bejeweled. The game's normal cost of $19.95 will be waived, but only until 10 P.M. PST tonight, October 10. Whether you own a PC or a Mac, PopCap has you covered with a free casual game if you want it. If you like casual games, and who doesn't, I don't see how you wouldn't want it for free. C'mon, just try it. You won't get addicted, I promise. But if you do, PopCap has a little game called Plants vs. Zombies you could check out next. And then, there's Peggle.